It's no surprise that I am a huge outdoor lighting fan of all types! 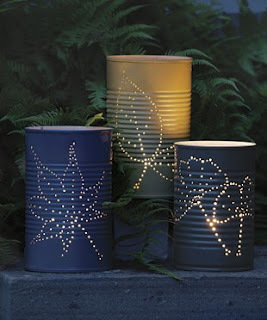 So, I thought I would share this easy, do it yourself outdoor lighting project for the summer. These "canterns" would be a great project for the kids (with adult supervision) and could be created in a variety of shapes and sizes, depending on the cans used. For detailed instructions, see HGTV's blog spot. Have fun!